VIDEOS~Double click videos, or use the arrows at the bottom right, for full screen viewing. Press esc keyboard button to return to page. Be sure to check our YouTube channel for all our latest videos! AUDIOS~Turning up the volume and using headphones can enable you to hear the recordings more clearly. An investigator comments on something not being creepy. We hear a childlike voice agreeing by saying "no". The sewing room is adjacent to the library. In the following recording an investigator asks if they can give a name. Two names were recorded from the SB7, "Lisa", one of the team members and "Brian", a gentleman from the preservation society who had not arrived yet. We ask if someone would like to jump rope. A team member says "naw" intuiting that answer, but immediately we hear a male voice say "no". In the following recording we hear what sounds like the same male voice telling a team member to "be careful". Three team members are in the upstairs hallway noting that they are directly above the basement stairs.We hear a voice telling them to "get down". Listen below. In the audio below a digital recorder was left in an upstairs bedroom when this voice saying "Watch it" was recorded. All team members were downstairs. This EVP was recorded during our walk through. You can hear a childlike voice saying "yoo-hoo" three times. The voice sounds the same as other EVPs that we have recorded at this location. A voice recorder was left in an upstairs room with the door closed. The entire team was downstairs. Listen to the two knocking sounds below. This room registered high EMF readings, for no apparent reason, on the Mel Meter during walk through. Numerous unexplained sounds were captured over the course of several hours. A child singing in the background can be heard below. Definitely not us as we were in the next room taking a break! A child's sing-song voice can be clearly heard below saying "um-no? umm-noo" ! This is a Class A EVP! Very chilling!! The EVP below was captured during the walk through at this location. We hear "I love you" and is clearly not us! In the audio below, listen for the humming that was recorded with our Full Spectrum camera. At the same time, one of our audio recorders in a room directly above the camera's position, captured the same humming sound, although fainter. In the audio and video files below we have captured the same voice on two different devices. The audio clip is from a voice recorder that had been left in an adjoining room while the video is from our full spectrum camera. Wait for the EMF detector to go silent and a voice can be heard saying, what we think is, " in the back ". It was determined later that the electrical wiring and breaker box located in this basement room were causing the high EMF readings. Two anomalies are seen below. We were still setting up when this was captured on our infrared camera! The following video shows a Rem Pod sitting on the floor in front of an old trunk. This is an upstairs hallway where residents have heard footsteps. You will notice when the Rem Pod lights up, indicating possible paranormal activity, a small unexplained light behind and above the trunk had just appeared. We thought at first it was the Rem Pod's light reflecting off the glass of a picture or mirror hanging on the stairway. However, when we examined this clip frame by frame, we found the lights were not in unison as shown in the still pictures from the video. Also when examing this video frame by frame, we discerned a mist like anomaly moving along the floor, rising above the Rem Pod causing it to activate, then rising further to go above an investigator's head standing in the doorway. See if you can detect it. Still shots from the video also seen below! A light can be seen just above the trunk but no Rem Pod light as of yet. The video below shows an orb passing over the chair where three flashlights are resting. One of the lights turns off as the orb passes over. Later, an orb passes over the same flashlight which immediately comes back on. There are lots of orbs in this clip which we assume to be mainly dust particles. The interaction of the orbs appearing to turn the flashlight off and then on, in response to the investigators questions, is why we don't totally ignore orbs. On the audio clip below, you can hear what sounds like a woman sobbing! Very creepy!! Now the Rem Pod is lighting up and the small bright light is still visible above the trunk! The Rem Pod remains activated but no "reflection" on the stairway and the small light has disappeared. The Rem Pod goes off shortly thereafter. The mist (circled above) hovering over the investigator. We followed this mist frame by frame as it moved along the floor then rose over the investigator to enter the room. This is the same room where we left a recorder and captured several EVP's and unexplained sounds! The video below has no visual evidence but the camera's microphone did record an EVP telling the two investigators to "Go!". In the beginning of the video below, watch for a small orb moving left to right in the open window. Later, there are three orbs traveling from left to right, lower left hand side. What is interesting is the investigator's reaction. She gestures from where the orbs originate. Also the resident dog was interested in the area where the orbs started, but calmed after they disappeared. Along with the fact that there were multiple orbs flying single file, appearing and disappearing within the frame of the picture, we believe these to be "real" orbs and not insects. The "talk in here"sound byte (further below,case 72013) also occurred in this room at approximately the same time. Multiple phenomena! An investigator asks for someone to walk across a driveway where the client previously had seen a figure of a man crossing. Footsteps or hoof steps can be heard in the following sound clip. The video clip below is from an active area of the home. Watch the doorway to the right of the screen. A very bright, double orb is visible moving into this room, but then circles back! In comparison, the first orbs you see are probably dust. In the audio clip below, investigators heard something with their ears, what sounded like "so". Upon review, it sounds more like "go home!" This voice was captured around the 3:00 am hour. When an investigator asked if someone would make the wind chimes move, we captured this sound in response! "oohm" Listen below. The video below was shot with our static infrared camera system. In the first segment of the stair head a white figure from the waist down can be seen walking across the hall. 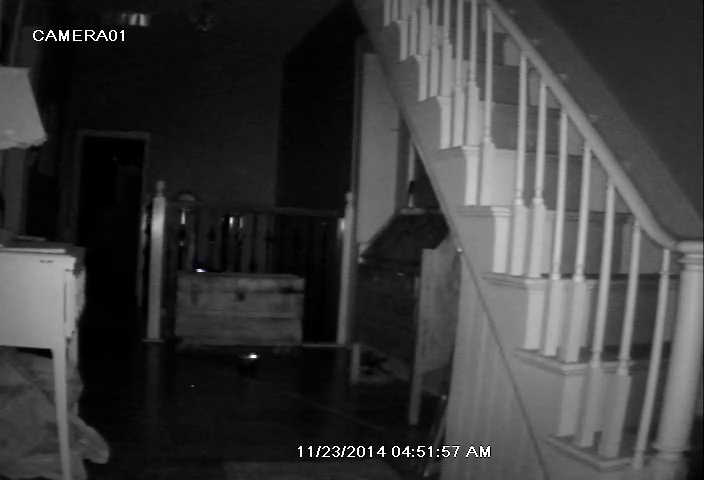 We find the video below interesting because just after an investigator asks "Are you hiding? 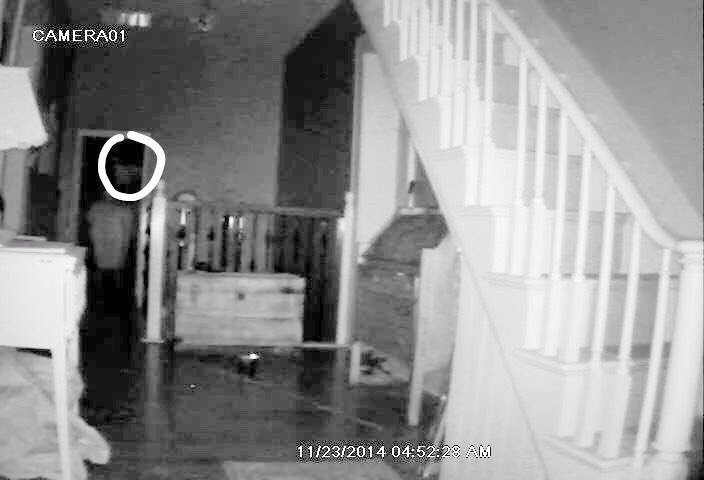 ", an orb can be seen leaving an area that investigators had sensed a presence. A digital recorder and an EMF detector were left together on a chair. A voice was recorded saying what we think is "Hello" with the EMF detector immediately responding. Listen to the clip below. The sound clip below was recorded on a digital recorder left in a bedroom. No investigator was in the room at the time. A female voice can be heard telling Frank to wake up! An investigator hears something off to the side of a path. Stating she didn't know what that was, a voice is recorded saying "Kwa-yun-ha". Our research shows that "kwa'y'ha" is the Iroquois (Oneida) and "kwa'yenha" (Mohawk) word for rabbit! The woods/area that we were investigating, was home to the Wyandot Indians who have ties to the Iroquois Nation. Fascinating! The audio below finds the C.A.P.E.R.S team taking a break at a picnic table in a private woods during an investigation. Digital recorders still on, a voice was recorded very close to the recorder saying "Someone's here". In the sound clip above you will hear an investigator speak and then a voice "Talk in here," then something unintelligible," why don't you? talk to me" followed by a sigh. The sigh could be a team member but the voice definitely was not! In the first sound byte above you will hear a whispery voice say what we believe is "Mel", at the same time as one of our investigators with that name, was coming down the stairs from the cupola. Sound byte below that is a voice saying what sounds like "Belle" in a room off the kitchen. Could it be the same voice? This video, directly below, is from our static camera. It captured a moving light anomaly/orb which disappears into the cupboard area. It occurred a short time after a scrying session was held, in which the spirit of a woman "Sarah" had been contacted. A resident in the home has seen the figure of a woman in the same location. While conducting the investigation it was noticed that one of the cupboard doors was open. During our initial sweep of the area it had been closed. We closed the door and it remained closed the rest of the investigation. team member #1 "Why am I hearing a clock ticking?" team member #2 "I hear it too"
team member #1 "Somebody have a watch on?" Just joining in on the conversation. Definitely a Class A. The unexplained female voice sounds like the voice in the EVP below. Both are from the same investigation in the same area of the upstairs. The house is empty. The above EVP was recorded during a second investigation of a now empty house. See case 42012. Two team members were in an upstairs room. One member's flashlight started " acting up ", at the same time she felt uncomfortable and wanted to leave the room. You can hear the team members footsteps and voices leaving the area while a voice is caught on the recorder which was left behind. The recording is looped and will play over three times. We hear the name Edith. Two investigators were in an upstairs hall going from one room to another. A voice can be heard saying "In the hall". The recording is looped and will play three times. Click above. This EVP was recorded in a utility room with a window looking out to a cemetery where all the headstones had been moved and many lost. One of the investigators was having an intense personal experience at the time, You can hear our voices in the background but we were all well away from the digital voice recorder. It is clearly a female voice saying, "Don't go.....and.....don't die". We get chills everytime we hear it! Click above. 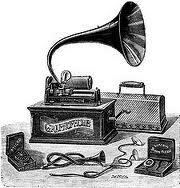 The EVP below was also recorded in the "red room" with a different recorder later in the investigation. A team member asked if anyone could ring the wind chime hanging from the ceiling. A "hmm" was captured. Is this a shortened version of the humming that was heard on the EVP above? You can plainly hear the name "Dave" which happens to be the name of a resident of this house. There are some other words which are not so plain. This a looped audio and repeats four times. Click below.